Determined to help growers and applicators maximize their spraying time, Hypro from Pumps and Sprays have designed a longlasting line of stainless steel centrifugal pumps that stand up to today's harsh chemicals. Pump life is extended and performance is increased due to Pumps and Sprays Hypro’s innovative ability to produce high quality materials suited to aggressive chemical solutions and the increasing use of fertilizers and trace elements in solution. The stainless steel housing and shaft, and the Life Guard silicon carbide seal are key components to Hypro’s stainless steel centrifugal pump line. The 316 stainless steel housing and shaft are what growers and applicators need for effectively handling corrosive and abrasive chemicals. The Hypro range of Stainless Steel centrifugal is ideal for use with Roundup or other acid applications, such as burn down and defoliation. The stainless steal pump can also withstand calcium and magnesium chloride solutions and other anti-icing or deicing agents. Hypro’s range of Stainless Steel pumps are also highly resistant to fertilizers and trace elements in solution such as Flexi-N which are very aggressive on most pump materials. The Life Guard seal, which utilizes silicon carbide (SiC) for its seal surfaces, is also more abrasion resistant than standard seals and comes standard with all Hypro Stainless Pumps. The O-ring style of the seal mating ring keeps the seal at a lower temperature and dramatically improves the chances of the seal to survive a dry-run episode. The pressure balanced seal also results in cooler operation at higher pressures. The Lifeguard seal can also be retrofitted to cast iron Hypro pumps as a drop in replacement. 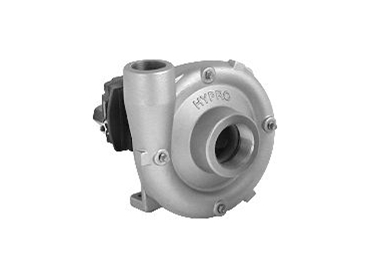 Hypro has also recently released the 9306 range of centrifugal pumps which are available in both Stainless Steel and Cast Iron models. The 9306 has a range of flows up to 810 litres per minute and pressures up to 9 bar dependent on hydraulic motor selected. The Hypro range of stainless steel centrifugal pumps provides growers with an increased choice in wear and chemical resistant pumps. For further information contact Mark Batson on 0428 465130.